Topics: General, Academic, General Vocabulary Exercises, and Academic Vocabulary Exercises. web2.uvcs.uvic.ca English Language Centre Study Zone: Welcome! 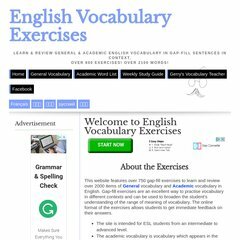 Academicvocabularyexercises.com's IP address is 66.118.156.121. Its 2 nameservers are ns13.webmasters.com, and ns14.webmasters.com. It is hosted by Sago Networks (Florida, Tampa,) using Apache/1 web server. PING www. (66.118.156.121) 56(84) bytes of data. A ping to the server is timed at 80.3 ms.